These turned out really well. I was so impressed with the doughnuts that I wanted to try the recipe baked instead of fried so thought of cinnamon rolls. The recipe is just the exact same as that for the doughnuts except I cut it in half and added 1/2 tsp vanilla extract. 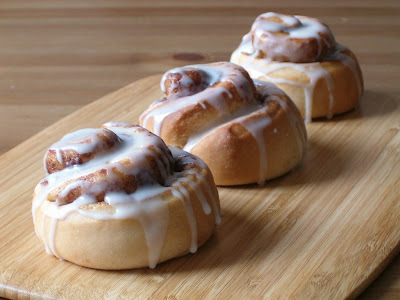 They are great just with the glaze as shown but I also had some vegan cream cheese that needed using so made another batch of cream cheese frosting which goes wonderful on these. 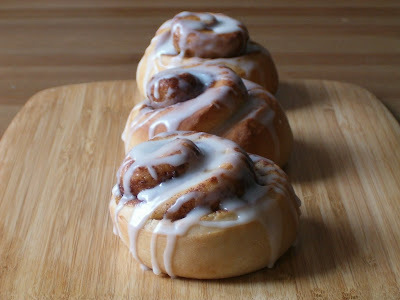 I made these plain inside but raisins and or chopped pecans would go very well, think I'll put pecans in next time. Follow directions for the doughnuts adding the vanilla to the dairy free milk. After the first rising, punch dough down and roll out to a square shape, about 1/2 inch thick. Spread with the margarine then sprinkle on the brown sugar and cinnamon, press down slightly. Roll up then slice into 8's or 4's. Place on a baking sheet lined with baking paper and cover loosely - let rise for another hour. Preheat oven to 180C and bake for about 15 min for the small size, slightly longer for the larger ones. They should be nice and golden. Transfer to a baking sheet to cool then mix up the glaze and drizzle over.